Introduction: Healthcare workers, in general, are susceptible to contracting with infectious diseases. Thus, appropriate infection control practices are of prime importance in academic institutions, wherein under-graduate students form a major part of the oral healthcare team right from the 3rd year of the curriculum. This fact underlines the need to provide extensive training to prevent healthcare-related infections to the patient and themselves. Aim: To assess the effectiveness of training related to infection control and waste management practices among under-graduate students in a private dental institution. Materials and Methods: The present study conducted among 3rd year under-graduate dental students in Pune, 2015 assessed their knowledge, attitude, and practices related to infection control and waste management followed by an intervention in the form of training. A quasi-experimental design (before and after comparison) was employed. Complete enumeration was performed. Results: Out of the 88 students, 46 (52.27%) had good knowledge at baseline, which improved to 72 (81.81%) after the training; 80 (90.90%) had good attitude, which improved to 88 (100%); and 67 (76.13%) had good practice, which improved to 88 (100%). At the baseline, the results showed that the mean knowledge score was 3.45 ± 1.03, the mean attitude score was 2.90 ± 0.28, and the mean practice score was 7.3 ± 0.76. After the training, the results showed that the mean knowledge score was 4.5 ± 0.25, the mean attitude score was 3, and the mean practice score was 8.1 ± 0.5. Conclusion: The training was effective in improving the over-all score of the participants related to the knowledge, attitude, and practice regarding infection control and waste management. Thus, we propose to train the students on various aspects of infection control and waste management and introduce an on-going training program in the curriculum. Introduction: Toothbrushes play an essential role in oral hygiene. However, toothbrushes can become contaminated through contact with the environment, from the oral cavity, and by toothbrush storage containers. Aim: To evaluate the effectiveness of vinegar, lime, and salt water as potential household decontaminants for toothbrushes. Materials and Methods: In an in vitro study, 120 used toothbrushes were collected and divided into four groups comprising 30 samples each. Group I was treated with plain water alone after use. Group II was treated with salt water. Group III was treated with a solution which contained lime juice. Group IV was treated with vinegar. Treatment duration for the groups was set to be 12 h. After the treatment, the brush heads of the four groups were incubated in brain-heart infusion agar at 37°C for 24 h. Statistical analysis was performed using the Statistical Package for the Social Sciences version 20.0 software. One-way analysis of variance and Bonferroni post hoc analysis were performed for multiple comparisons. Results: Vinegar group showed statistically significant result for decontamination of toothbrushes when compared to other test and control agents. Conclusion: Commonly used household materials can be potential decontaminants for toothbrushes. The results of this study showed that vinegar was the most effective decontamination agent followed by lime and salt water. Introduction: Sense of coherence (SOC) influences an individual’s health-related behaviours and practices. A mother’s SOC can influence oral health status and oral health related quality of life (OHRQoL) of their children. Studies exploring the association between these variables are scarce. Aim: To determine a mother’s SOC, the child’s caries experience and OHRQoL and the association between these variables among mother–child pairs in Bangalore city. Materials and Methods: A total of 200 preschool children and their mothers from government and private preschools participated in the study. The mother’s SOC was assessed using Antonovsky’s 13-item SOC questionnaire, whereas OHRQoL of preschool children was assessed using Early Childhood Oral Health Impact Scale (ECOHIS). Caries experience [decayed, missing and filled teeth (dmft)] was recorded using World Health Organization criteria 2013. Descriptive and inferential statistics were applied. Mann–Whitney U test, t-test, Pearson correlation test and regression analysis were also applied. Significance was set at 5%. Results: The mean SOC score of the mothers and ECOHIS score were 53.79 ± 11.68 and 17.23 ± 7.87, respectively. The mean caries experience score was 0.99 ± 1.48. In this study, dmft negatively correlated with SOC [(r = −0.367), (P < 0.001)] and positively correlated with ECOHIS [(r = 0.679), (P < 0.001)]. SOC negatively correlated with ECOHIS [(r = −0.369), (P < 0.001]. Conclusion: Mother’s SOC negatively correlated with the child’s caries experience, which affected their OHRQoL. Hence, improving a mother’s SOC is the key to better oral health and quality of life. Introduction: Dental caries is one of the most common oral health problems in childhood. As a child depends entirely on the parents, its dental visit could be influenced by various psychosocial factors such as parental perceptions of the child’s oral health and maternal anxiety. Aim: To assess the influence of children’s clinical condition, mothers’ dental anxiety and their use of dental services, maternal perception of child’s oral health-related quality of life (OHRQoL) on the child’s utilization of dental services. Materials and Methods: A cross-sectional survey was conducted among 600 mothers of children between 2 and 5 years of age. The questionnaire included the background characteristics, mothers and child’s dental visit, mothers’ dental anxiety using Corah’s Dental Anxiety Scale and maternal perceptions of the child’s OHRQoL using Early Childhood Oral Health Impact Scale. Clinical examination for assessing the dental caries among the children was performed. The data were analyzed using the Statistical Package for the Social Sciences version 17.1 software. Results: Using the final model of Poisson regression analysis with robust variance and forward stepwise procedure, it was found that the age of mother, the age of child, the income of the family, poor OHRQoL, the presence of caries and pain in child significantly influenced the visit of the child to dentist (P ≤ 0.05). No statistically significant association was found between the anxiety of mother and the child’s visit. Conclusion: Lack of maternal knowledge, low socio-economic reasons and maternal perception of child’s oral health could be the important reasons for a child’s less number of dental visits. Introduction: It is very well documented that oral health has a noticeable influence on not only physical but also psycho-social domain of life. Quality of life (QoL) is now recognised as a valid parameter in patient assessment in nearly every area of healthcare, including oral health. Aims: To assess whether the subjects’ complaints affect their QoL and also to determine possible socio-demographic and personal habits-related determinants related to oral health QoL. 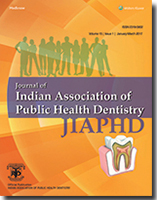 Material and Methods: This cross-sectional descriptive study was performed in a dental institute in Moradabad, Uttar Pradesh, India, from January 2013 to April 2013 on 1054 subjects. Examination of subjects and recording of questionnaires wereperformed by four researchers. Two patient-centred outcome measures, the 14-item Oral Health Impact Profile (OHIP-14) and the 16-item Oral Health-related Quality of Life (OHQoL-UK) measure were used. The OHIP-14 and OHQoL-UK scores of groups were expressed as median (interquartile range). The Mann–Whitney and Kruskal–Wallis tests were used for statistical analysis. Results: OHIP-14 scores were highest and OHQoL-UK scores were lowest in subjects who came with trauma. OHIP-14 scores were lowest and OHQoL-UK scores were highest in subjects who had orthodontic or aesthetic complaint. It was seen that there was a statistically significant difference in OHQoL-UK (P < 0.001) and OHIP-14 (P < 0.001) scores of subjects according to complaints. Conclusions: OHQoL is poorer in subjects who have complaints of oral disorders. Introduction: Seventy percent of premature deaths in adults occur owing to harmful behavioral patterns such as smoking that emerged in adolescence. The rising trend of adolescent addiction to cigarettes is a cause for worry. Aim: To assess the prevalence of cigarette smoking in adolescents and to investigate the different psychosocial determinants which influence them to either smoke or not to smoke. Materials and Methods: A cross-sectional study was conducted in higher secondary schools of Panchkula, India. A self-structured questionnaire was used to assess the smoking behavior and other associated factors among 584 school going adolescents in the age group of 14–19 years. The proportion, the chi-square test, and bivariate and multivariate logistic regressions were applied. All analyses were done using the Statistical Package for Social Sciences, version 17.0 software. Results: The prevalence of ever smokers was 13.5% including 10.5% males and 3% females. Male students were more likely to ever smoke than females [odds ratio (OR) = 4.01; 95% confidence interval (CI): 2.84–6.14]. Subjects in the late adolescence were more likely to ever smoke than the middle adolescents (OR = 2.18; 95% CI: 1.18–3.67). Students in grade 12 had more than four times the odds of ever smoke than those in grade 10 (OR = 3.83; 95% CI: 2.34–5.67). Cigarette smoking was six times more likely if students had seen their sibling ever smoke (OR = 6.3; 95% CI: 3.16–9.69), three times more likely if a best friend smoked (OR = 3.18; 95% CI: 1.82–5.67), and two times more likely in students who had seen their father smoking (OR = 2.18; 95% CI: 1.67–2.84). Conclusion: A strong association exists between cigarette smoking behavior and different psychosocial factors, highlighting the need for efforts from parents, siblings, teachers, and peer groups to discourage smoking behavior. Introduction: Community-oriented oral health promotion programmes can be efficiently targeted by assessing the oral health status comprehensively. Aim: To investigate oral health status and normative needs of college students in Mangalore, Karnataka. Materials and Methods: A descriptive study was done among 720, 18–20-year-old students attending degree colleges in Mangalore using multi-stage random sampling. Oral health status was recorded as per World Health Organization oral health assessment form. The data were coded and analysed using the Statistical Package for the Social Sciences (SPSS) 11.5 version software. Results: Overall dental caries prevalence accounted to 68.1%, with a mean Decayed, Missed and Filled teeth (DMFT) of 1.94 [males had higher DMFT score (2.06) than females (1.82)], and majority of the students required one surface restoration. Periodontal status of the students as measured by Community Periodontal Index (CPI) showed that majority of the study participants (34.9%) had calculus necessitating the need for oral prophylaxis. Conclusion: Oral health status of the age groups not traditionally studied gives the complete picture of the oral disease burden, indicating the need of oral heath preventive measures among college students in India. Introduction: Drinking water is one of the major sources of fluoride. India is one of those 24 countries where fluorosis is an important public health problem. When excess fluoride is ingested during the years of tooth calcification, it results in fluorosis. Aim: To assess the prevalence of dental fluorosis among adolescents in schools of Greater Noida, Uttar Pradesh. Materials and Methods: A total of 1318 students were examined for dental fluorosis through a stratified sampling technique from four blocks of Greater Noida. Dean’s Fluorosis Index was used to record dental fluorosis and information regarding the source of water till the age of 8 years, usage of fluoridated toothpaste before 2 years of age and other affected family members, which was obtained from their parents. Results: The overall prevalence of dental fluorosis in Greater Noida was found to be 21.0%. A very mild form of dental fluorosis was seen in 27.6% of the adolescents. The source of water consumed by the adolescent till the age of 8 years was found to be significantly associated with dental fluorosis (P = 0.001). Adolescents who consumed water from the hand pump were more likely to develop dental fluorosis. The reporting of an affected family member was seen to vary significantly with the relative score of dental fluorosis observed for that adolescent. The value of Community Fluorosis Index (CFI) was found to be 1.7. Conclusion: Dental fluorosis seemed to be a problem of medium public health significance in Greater Noida as suggested by the observed CFI, which was 1.7. The consumption of water from the handpump by majority of the population was associated with fluorosis. Introduction: Telangana state in southern India has many areas which have high–low fluoride levels in drinking water, and Mahabubnagar district is one among them, where people are affected with dental and skeletal fluorosis, with the majority belonging to low socio-economic status. Aims: To assess the prevalence of dental fluorosis in school going children of Mahabubnagar district and also to assess fluoride levels in drinking water from different areas of Mahabubnagar district. Materials and Methods: A cross-sectional study was conducted on 2000 children in the age group 6–12 years in different areas of Mahabubnagar district. Dental fluorosis status was assessed by using Modified Dean’s Fluorosis Index. Alizarin visual method was used to estimate fluoride levels in water. The data collected were subjected to statistical analysis. Results: Dental fluorosis in primary and permanent dentition was 15 and 70.3%, respectively. In the northern part of Mahabubnagar district, primary dentition was more affected by fluorosis whereas in southern part, the permanent dentition was more affected. The prevalence of dental fluorosis in primary dentition was more in 6–7-year-old children (35.5%), and in permanent dentition, it was more in 9–10-year-old children (70%). The fluoride level in drinking water was more in Kosghi, Kalwakurthy (2.0 ppm). Conclusion: Dental fluorosis was more in 10-year-old and less in 6-year-old children. It was more in eastern and northern zones of Mahabubnagar district and less in local villages of Mahabubnagar. Introduction: Occupational hazards among oral health care providers are becoming a major problem. Aims: To assess various occupational hazards and assess the musculoskeletal problems and their association with the work pattern. Materials and Methods: A questionnaire-based descriptive study was conducted among 525 private dental practitioners of Jodhpur city. Self-administered questionnaire was distributed and obtained immediately after the participants filled it. The data collected were tabulated and subjected to statistical analysis using the Statistical Package for the Social Sciences (SPSS Inc., Chicago, IL, USA) version 18 software. Chi-square test was used to find the association. Results: Among the study group of 525 dentists, 300 were males and 225 females. Sitting dentistry was practiced by 61.7% and only 18.8% practiced standing dentistry. Dentists suffering from back pain were 40.7% whereas only 4.1% of dentists had shoulder pain. A highly significant correlation was observed between posture of dentists and musculoskeletal problems (P = 0.001). When chi-square test was used to assess the correlation among years of working experience and musculoskeletal problems, a significant relation was observed (P = 0.000). Conclusion: Almost all the private dental practitioners were suffering from the occupational hazards. Back problems were common. Regular training and workshops can help lower such problems. Introduction: Dental professionals have a responsibility to conserve natural resources and to eliminate/reduce toxic wastes from their practices that could harm human health and environment. Aim: To investigate the implementation of eco-friendly dental office strategies by the dentists of tricity (Chandigarh, Panchkula, and Mohali). Materials and Methods: Self-designed questionnaires were distributed to 120 Indian Dental Association registered dentists. Descriptive statistics and cross tabulations were calculated using the Statistical Package for the Social Sciences version 20.0 software. 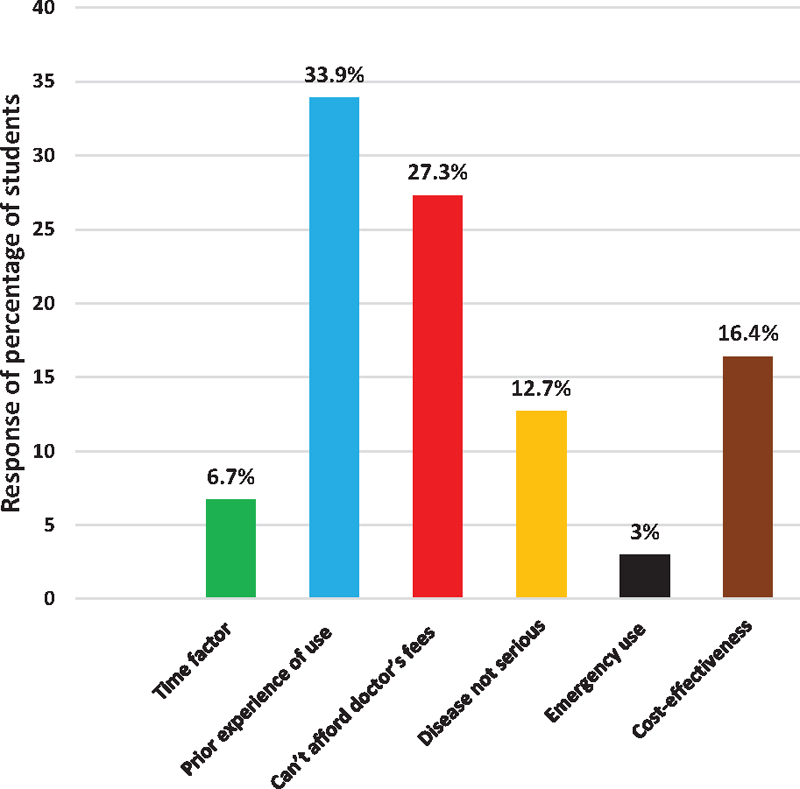 Results: Most of the dentists followed eco-friendly dental practices including the alternatives to amalgam filling (98%), use of light-emitting diode bulbs (91%), unplugging electronic devices when not in use (96%), use of steam sterilization with cloth instrument wraps (93%), using reusable lab coats (89%), and using digital radiography (78.6%). 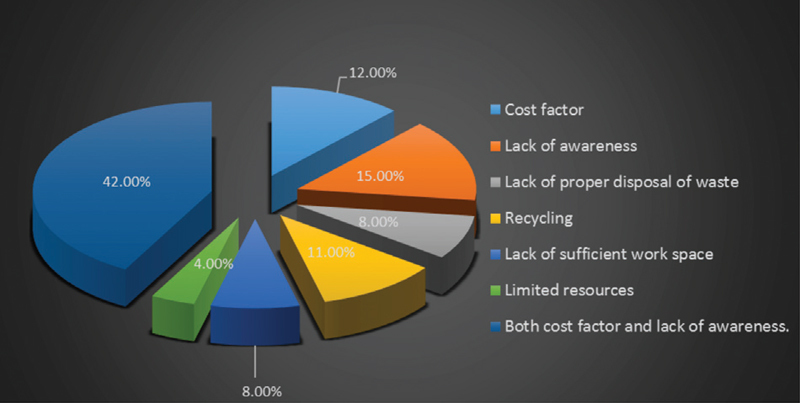 The most frequently identified barriers to implementation of eco-friendly dental office strategies were cost and lack of incentives from the government. Conclusion: Eco-friendly practice implementation by dentists is at its stage of infancy. There is a need for creating awareness among dentists regarding eco-friendly dental practices through formal and continuing dental education. Introduction: Bioterrorism, as a major health problem, has received lots of attention in the recent years. It is the intentional use of microorganisms and toxins to produce disease and death in humans, livestock, and crops; their attraction in war and their use in terrorist attacks are attributed to various unique features. Aim: To assess the knowledge and attitude of graduate dentists and postgraduate dentists toward bioterrorism in Dhule city, Maharashtra (India). 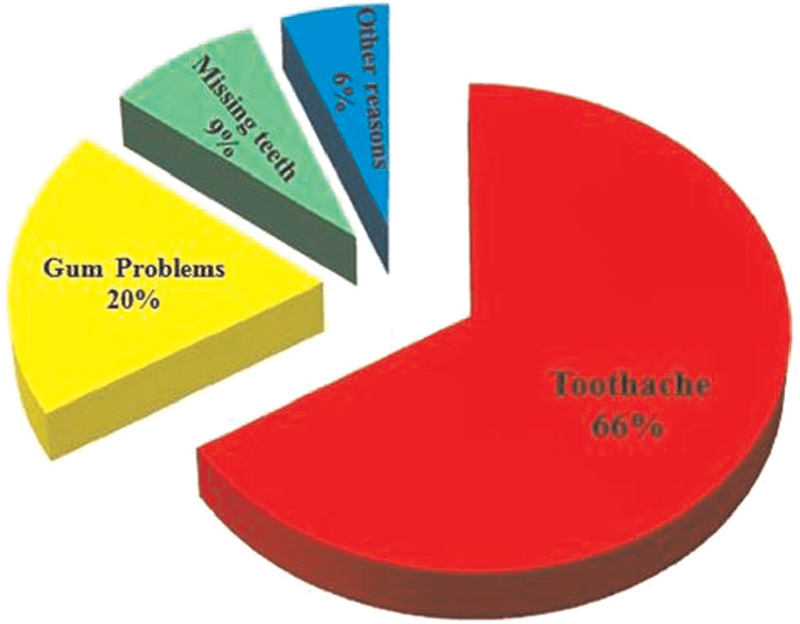 Materials and Methods: A cross-sectional study included graduate dentists and postgraduate dentists in Dhule, Maharashtra, India. The list of dentists of Dhule city was obtained from the Indian Dental Association office, Dhule branch. Among 110 dentists practicing in Dhule city, 97 responded. A structured, self-administered questionnaire consisting of 15 closed-ended questions was employed. The information regarding age, gender, and profession (specialty branch) was collected. The data were tabulated and subjected to analysis using Pearson’s chi-square test. Results: Statistically significant difference was seen when knowledge and attitude of dentists and dentists with postgraduate qualification toward bioterrorism were compared (P < 0.05). Conclusion: Dentists with postgraduate qualification have better knowledge and attitude toward bioterrorism as compared to graduate dentists. Most of the dentists felt the need to educate the public regarding suspected bioterrorist attack, and they were willing to do so and had the confidence that it was preventable. Introduction: Students and faculty members in the health professions classroom are expected to exhibit professional behaviors that are conducive to maintaining a positive learning environment. Aim: To assess the perception of uncivil classroom behavior among the students and the faculty members in a private dental institute in Hyderabad city, India. Materials and Methods: A cross-sectional questionnaire study was conducted among the dental students and the faculty members. The mean perceptions of uncivil classroom behavior were assessed using a self-administered questionnaire of Rowland and Srisukho containing 18 items. Results: A statistically significant difference was noted between the students and the faculty members for mean perception of uncivil classroom behavior (P = 0.002). When based on gender, no significant difference was observed among the students and the staff, but when individual items were considered, most of the male students and the faculty members perceived uncivil behaviors. Among all students, the mean perception of uncivil classroom behavior was significantly high among the undergraduates (68.17 ± 14.5) and least in postgraduates (62.67 ± 22.7), and among the faculty members, it was more among the professors (82.63 ± 4.0). Conclusion: Overall, the issue of uncivil classroom behavior remains a major concern, because 88.6% of the students agreed that they were involved in uncivil classroom behavior previously. Introduction: Biostatistics is a discipline concerned with how we ought to make decisions when analysing biomedical data. As statistics is desirable at every stage of research to obtain scientifically important information and reliable results, the importance of biostatistics should definitely be informed to the researchers in health sciences. Aim: To evaluate the knowledge, attitude and perception of dental professionals towards biostatistics. 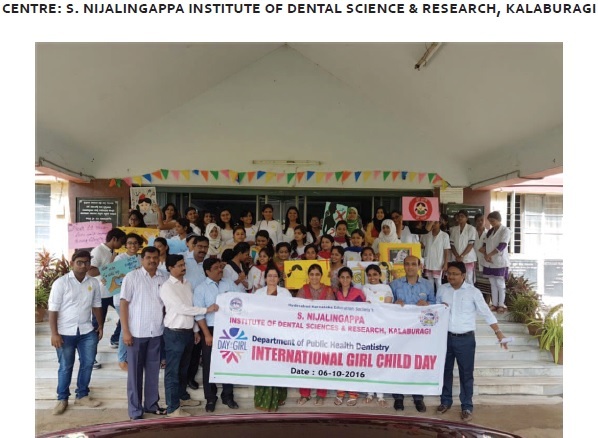 Materials and Methods: A cross-sectional study was conducted to assess the knowledge, attitude and perception regarding biostatistics among 721 postgraduate students in dental institutions of Andhra Pradesh. All the participants were provided with a pre-structured questionnaire comprising 21 questions, and answering was completely self-paced. Results: Among the respondents, 86% were aware of the importance of biostatistics in research. Forty-five percent of the respondents attempted to perform statistical analysis on their own. Of all the students, 53% were unable to identify the commonly used parametric tests in clinical trials. Conclusion: Majority of the participants were aware of the importance of biostatistics, but only a few of them attempted to perform statistical analysis. Therefore, dental institutions should take initiatives in organising workshops and training programmes for learning and application of biostatistics, concomitantly encourage research activity to conduct valuable research and add up evidence to literature. Introduction: Self-medication is defined as use of medicines by the individuals on their own without professional advice to treat self-diagnosed conditions. It is prevalent not only among general population but also among doctors including dentists. Aim: To assess the pattern of self-medication practice among students of a dental college of Bangalore city. Materials and Methods: A cross-sectional study was conducted among undergraduate dental students through convenience sampling. A questionnaire consisting of 20 close-ended questions related to various aspects of self-medication practice was handed to the students. Results: Among 165 students, 68.5% of the participants were females. The most common ailments responsible for usage of self-medication were cough, cold and sore throat (22.4%) followed by headache (6.7%). Antibiotics (34.2%) and analgesics (23.9%) were the most commonly used drug groups for self-medication. Old prescription (58.2%) was found as the most common source of information for encouraging this type of practice. Conclusion: Majority of the dental students self-medicate themselves. Measures should be adopted to reduce such type of practice by guiding the students about the pros and cons of using medicines without prescription. Introduction: The patients with cancer experience a range of challenges that can be physical, mental, and psychological. Hence, proper supportive care needs should be provided to the patients with oral cancer during the postoperative period, which can have a great impact on them and their family caregivers. Aim: To assess the perceived levels of supportive care needs, namely psychological, interpersonal communication, patient support, health information, and physical needs, of the patients with oral cancer in a metropolitan city. Materials and Methods: A cross-sectional study was conducted. One hundred and twenty patients were recruited from various cancer hospitals’ inpatient wards in the city of Hyderabad. A questionnaire was used to assess the patients’ needs, including the Karnofsky’s Performance Status Index and Cancer Needs Questionnaire Short Form. Descriptive statistics were calculated. Regression analysis was performed to find the predictive factors of various needs domains of the patients, and P < 0.05 was considered statistically significant. Results: In general, the patients reported the highest level of supportive care needs in the “Psychological” domain among six needs domains, followed by interpersonal communication needs, patient support needs, health information needs, and physical needs. Factors significantly related to those supportive care needs across six domains were stage of the cancer when admitted, past treatment underwent, occupation, location of the cancer, duration of the treatment, and undergoing problems during the treatment. Conclusion: Needs that were considered to be more important by the patients were the psychological needs and interpersonal communication needs, especially in the period within which they are being treated and when undergoing tests to determine the stage of the cancer. Routine screening for psychological and physical distress should become a first step in the assessment of the psychosocial needs of people receiving inpatient treatment for the cancer. Introduction: Dental quackery has become one of the most unethical practices misleading majority of the Indian population. It has become prevalent to such a grass-roots level that curbing this menace is becoming very difficult. This mockery of dental practice imparts unethical dental care to the innocent people and results in complications, which sometimes lead to death of the individual. Objectives: To estimate the prevalence of visits to dental quacks, and to describe the factors influencing these visits. Materials and Methods: A cross-sectional study was conducted for a period of 3 months in Bhopal, Madhya Pradesh. Study participants were recruited from one of the satellite centres of a private dental institution. Information regarding visits to dental quacks, reasons for the visit and self-rated oral health was obtained from the participants using structured questionnaires and face-to-face interviews. The obtained data were analysed using chi-square test and logistic regression analysis. P < 0.05 was considered statistically significant. Results: Out of 314 people who visited the centre during the study period, 280 (92%) agreed to participate in the study. The prevalence of the visits to dental quacks was 42.1%. The participants who visited quacks were older and less educated. The reason for preferring a quack to a dentist was primarily because of the referrals provided by the family members and peers. The most common reason for visiting a quack was toothache (66.1%), and tooth extraction was the most common treatment received (33.8%). Conclusion: Age and level of education significantly influenced the visits to dental quacks and are the two major factors influencing such visits. Introduction: Oropharyngeal candidiasis is an opportunistic mucosal infection caused by Candida albicans. It usually responds to topical treatments such as clotrimazole troches, topical fluconazole, chlorhexidine mouthwash and nystatin suspension. Piper betel leaf oil and Origanum vulgare essential oil have shown some topical antifungal activity. Aim: To determine and compare the antifungal efficacy of piper betel leaf oil, O. vulgare essential oil and fluconazole suspension against C. albicans. Materials and Methods: The zone of inhibition was measured by the cup–plate diffusion method using 100 μl volume of piper betel leaf oil, O. vulgare essential oil and fluconazole suspension, which were pipetted into the wells of the inoculated Sabouraud’s dextrose agar plates. The zone of inhibition was measured in millimetres using Vernier calliper. Minimum inhibitory concentration (MIC) was determined by the broth macro-dilution test by pouring 1 ml of the respective concentrations of the test material to the individual test tubes along with 10 μl of the diluted test organism inoculum. Finally, MIC was calculated using a reflective viewer. Results: The zone of inhibition for O. vulgare essential oil (>40 mm) was more than fluconazole suspension (>35 mm). MIC of O. vulgare essential oil, piper betel leaf oil and fluconazole suspension was 1.6%, 0.4% and 0.8%, respectively. Conclusion: O. vulgare essential oil was found to be a more effective antifungal agent than piper betel leaf oil and fluconazole suspension. Introduction: Several adsorbents have been tried in the past to find a proficient and cost-effective defluoridating agent. Many of the methods have some precincts because of the low adsorption capacity, poor integrity and need for pre-treatment. Aim: To evaluate the efficacy of three natural, low-cost, household-level products to remove fluoride from standard water. Materials and Methods: In this in vitro study, a standard solution of fluoride and a known weight of tulsi leaves, drumstick leaves and tamarind seed powder was prepared and analysed for changes in fluoride level and pH level on treatment at baseline, after 6 h and after 24 h. Results: Amongst the three plants, Tamarindus indica was found to be more effective in defluoridation showing a reduction up to 0.18 parts per million. Conclusion: Amongst the aforementioned three plants, tamarind seed powder was the domestic material with the best defluoridation property. Introduction: Dental-unit water line (DUWL) contains various microorganisms. American Dental Association and the Centers for Disease Control and Prevention have suggested a standard for dental-unit water system water as water not having more than 200 cfu/ml. Aim: To assess the microbial contamination in DUWLs. Materials and Methods: Two dental chairs, each from four clinical departments, were randomly selected in this study. A total of 31 water samples were collected from each chair containing airotor line, scaler unit, 2-way syringe and oral rinse unit. In one dental chair in the Department of Periodontics, the sample from airotor point was not assessed, as it was not functional at the time of assessment. The samples were inoculated into blood agar, MacConkey agar and peptone water and cultured at 37°C overnight. Result: Colony-forming units were above 500 cfu/ml. The organisms identified were mostly gram-negative bacilli particularly Escherichia coli, Pseudomonas and Klebsiella, as well as gram-positive bacteria such as Enterococci. Conclusion: DUWLs are heavily contaminated with waterborne organisms from biofilm within the tubes as well as human pathogens as a result of the back-siphonage from oral cavity of patients. These organisms may cause serious systemic infections to patients, especially the children, the elderly and the immunocompromised. Periodic checking of anti-retraction valves and disinfecting within the dental water unit system are mandatory.